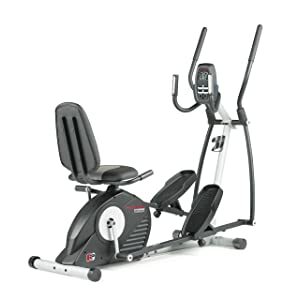 Unlike other elliptical machines in our best elliptical machines list, the Proform Hybrid Trainer is, as the name suggests, an elliptical machine that has been merged with another exercise machine, in this case a recumbent bike. As fitness enthusiasts wold be well aware, recumbent bikes make for excellent cardio workout systems, and when combined with the elliptical machine benefits, you get the best of both worlds. With the particular machine, Proform has put in its very best in terms of design, features and of course, pricing, making it the ideal workout machine for a wide range of people. Proform maintains the standards expected of premium exercise equipment by providing an ergonomically designed and very durable frame. The confidence of the manufacturer in the durability of this machine can be gauged from the fact that it comes with a 5 year warranty on the frame. There is also a 90 day warranty on parts and labor. This may seem rather less at first sight, but you must remember that the price of the Proform Hybrid Trainer is a fraction of what the high end machines from Schwinn or Sole Fitness demand. At this price range, this warranty is standard across the industry. Furthermore, despite having all the features of a recumbent bike, the weight of the machine is substantially lower than that of other top elliptical machines at just 149 pounds. Transport wheels have been provided at the lower end for easily moving it once workout is over. Even with such a low machine weight however, it supports users up to 350 lbs in weight. For comparison, only the machines from Sole Fitness, Sole Fitness E95 elliptical machine comes with 400 pounds capacity, beat this, and that too not by a large margin. There are 14 digital resistance levels, which is again great considering the price and should be able to serve most average family members without much difficulty. Using SMR (Silent Magnetic Resistance) Technology, they ensure that the working of the machine is extremely smooth and quiet, just as you would expect from high end machines. Like all good elliptical machines, the Proform Hybrid Trainer comes with two sets of handlebars – one static and one movable. The static handlebars have heart rate monitors to supply relevant data to you through the control panel. Both sets of handlebars are ergonomically designed to ensure that you do not suffer any pressure on your hands. Since this machine also includes a recumbent bike, it is provided with an adjustable seat. Below the seat you have the pedals which can be used during a recumbent bike workout. Both of these have been seamlessly integrated with the elliptical machine parts, so as to ensure that you do not have to carry out major adjustments when shifting from one type of exercise machine to another. The other major part of the elliptical machine is the flywheel, whose weight determines the smoothness and stability of the elliptical trainer. Proform has provided this hybrid trainer with a inertia-weighted heavy duty flywheel to ensure this very stability and smoothness. To these can be added a pair of levelling feet, which ensure that no matter how uneven the surface is, your workout is not affected due to machine instability. Those comparing this machine with our other top elliptical machines would note the absence of a cooling fan and speaker. However, such amenities are not available in this price range, and the Proform Hybrid Elliptical machine merely confirms this. This trainer provides a stride length of 15 inches, which is sufficient for all but those with the largest legs. The footplates are oversized to ensure that those with large feet can work on this machine with ease. Furthermore, the footplates are adjustable so when you are working on the recumbent cycle, there are no problems with adjustment. Proform has provided this device with a large LCD display that is capable of simultaneously displaying many vital metrics such as distance traveled, calories burnt and most important of all, the heart rate. Using theEKG Heart Rate Monitor, it uses the dual grips of the fixed handlebars to monitor the heart rate, which are then fed into the heart rate program to measure the heartbeat, rate of recovery, etc. Moreover, fourteen apps have been provided to allow you to workout according to regimes designed by a Certified Personal Trainer. Furthermore, a target pacer has been provided to monitor your cardio goals. A light blinks to tell you whether you need to speed up or slow down to reach your cardio goals in time. The Proform Hybrid Trainer comes with padded handlbars, cushioned footplates and an equally well padded seat. This, added to the stability provided by the weighted flywheel and the levelling legs underneath the machine, allows you to enjoy a smooth and comfortable exercise every time. Although it lacks some of the special features found on high-end machines, it more than makes up for it by providing the recumbent cycle and elliptical machine benefits in one machine. Added to this are the extremely lightweight but well built structure and the excellent features (like Silent Magnetic Resistance) that are on offer. When considered as a complete package, these tend to make the Proform Hybrid Trainerfar more value for money than any of the elliptical machines available today in the lowest of the price brackets. Click here to see more cardio machines.